During a water management and adaptation study in the Gandaki basin in Nepal I had an opportunity to explore people’s relationship to water in the Vyas municipality. Firstly, I studied how climate change effects on urbanization were forcing residents of the city to adapt to water scarcity. Secondly, I looked at what kinds of impacts were being felt at household and community levels. The findings were collected through surveys and interactions with people about their perceptions. Though people in the area do not yet know the meaning of the term climate change, I came across several phrases being used by them to describe the changes they were experiencing. ‘The summer is getting hotter’, ‘Rainfall is becoming less’, and ‘This spring is really dry compared to 20 years ago, and it’s creating shortage of water’ are some examples of what I heard. For this particular study I had gone to the village of Manungkot, where I explored an ingenious form of adapting to water shortage through rain-water harvesting. Manungkot village, a peri-urban settlement in Vyas Municipality located on top of a hill, lies at 1042 metres above sea level. It houses a community of ethnic people called Magar. Their ancestors had migrated from the lowlands after a malaria epidemic in the 1960s. The number of households, initially over 60, had fallen to 40 in 1976. Today only 8 households survive, and they have limited means to be able to migrate to other locations. The village has only a dirt track giving access to the main road. People can be found walking for at least 4 hours daily, since there is no regular bus service. Before 1994, springs were a major source of water in the area. Initially, people used to fetch water from there daily, a task that took 1-2 hours. To remove this drudgery of every day, villagers decidedto go in for a manmade pond. It became some sort of hydraulic earth work, so to speak: simple scooping earth into a pit, putting stone embankments around it, and covering it with plastic – all for rainwater collection. In recent years there was increasing pressure on water for drinking and cooking due todrying up of the springs in pre-monsoon and winter seasons. Then people took the initiative to conserve rain for their daily consumption. They made a concrete tank with,money and technical support from the Ministry of Water in 1992. The structure of this rainwater harvesting system is quite simple. 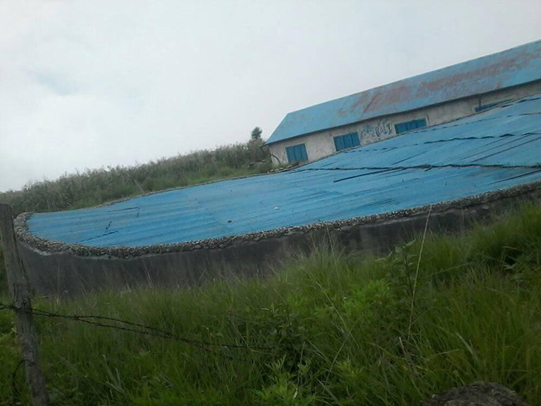 When it rains, the water runs off the corrugated metal, curved roof of the village school building into a round plastic pipe at the back, and from there it is collected in the chamber of the harvesting tank. This is a big, cylindrical structure, partially standing upright and partially buried in the ground (3 metres underground and 1.25 metres above ground) with approximately 117,000 litres carrying capacity. Villagers have a plan to convert 8 of the thatched roofs of houses into catchment areas for individual rainwater harvesting to cope with household water scarcity. They are proposing the plan and coordinating with the Municipality and District Drinking Water and Sanitation office in Damauli. The residents are always conscious of the limited water supply and use it frugally. In the monsoon season, water is harvested at the rate of approximately 45 litres per household, and in the summer and autumn, 20 litres per household, on a daily basis. Families stop using the harvested water, when the water level in the tank gets down to two metres, and also when the rainfall decreases, especially during spring and winter seasons. There are two filters between the pipeline and the tap, and the tank gets cleaned every year in March. So far, there seem to have been no health hazards as a result of this rainwater consumption. The man-made pond people have been traditionally using for bathing, washing, and cattle feeding. It is located on the east side of the village, and it takes about 45 minutes on foot to get there and back. When the villagers need funds for maintenance and repair, they go to the Municipality and Drinking Water office for both technical and financial support. Recently they had received funding from the Municipality under the Environment-Friendly Local Governance Programme (EFLGP). Women seem to have a leading role in the community, because male members go to the city for work. For instance, a woman holds the chairmanship of a saving and credit group. 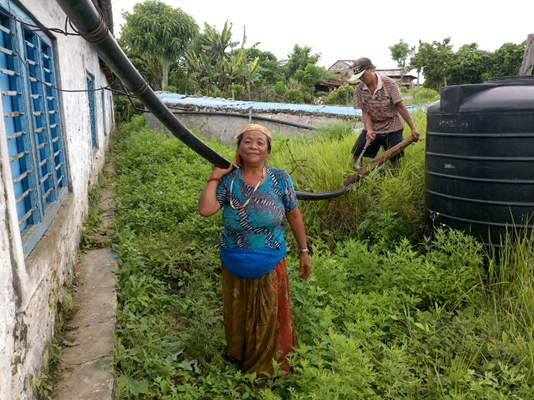 Other women are members of Community-Based Organizations, and they are actively involved in the construction and maintenance of the rainwater supply system. Taking care of the rainwater collection and distribution system requires collected effort from women. In addition, women get up at five in the morning, collect water, and prepare meals for their families. Men get ready to go to the city for work at seven in the morning and return home at eight at night. It takes them those two hours each way on foot, to get to the city and back home. Men spend their entire day working as stone workers in city masonry work. A routine day for women consists of collecting grass and feeding cattle, pigs, and/or chickens, apart from the above chores. The residents of the village wait for the life-sustaining rains throughout the year. Low and erratic rainfall agonizes them. If it does not rain for a week in Summer, it saddens>upsets?them and, so, they worked out this contingency plan to start using stored rainwater economically. Though people are in need of a separate rain storage tank for each household, lack of money prevents them from meeting this need properly, because they live on a hand-to-mouth income. But their community effort to preserve this common property of rainwater (through this supply system) shows that rainwater harvesting is not only useful to counter their vulnerability but also to make them climate-change resilient. 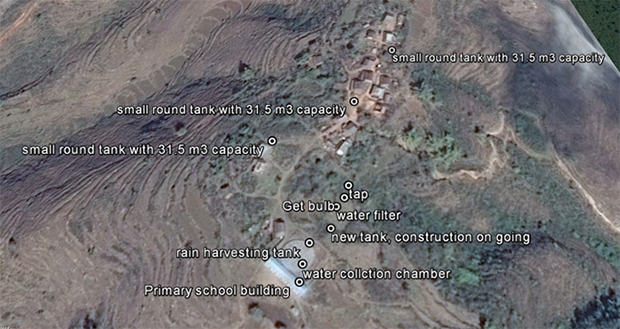 Rainwater Harvesting Tank Manungkot: Household with a small cylinder-shaped rain harvesting tank nearby not clear which building; the small rectangular one on the right?